I’ve lived on this planet for over half a century. I am college educated. I have an executive position in an international agency. I also believe God gave us rational minds capable of discerning between right and wrong, wise and foolish, practical and impractical, and sanity and lunacy. You would think by now I would have the sense not to eat something that should not be eaten by any rational person, at least not with international travel looming a few hours later. The food in question was a hot sauce concocted, probably by some witch-doctor-in-a trance channeling the Marquis de Sade, from the Piaroa tribe in Venezuela’s Amazon jungle. The comforts and benefits of modern civilization, assuming they are generally beneficial or at least benign, have not fully reached the Tarzan-worthy jungles of Venezuela. However, the technology enabling the Piaroa to bottle their hot sauce has reached through the jungle canopy, allowing them to export their biological weapons–under the guise of hot sauce–to an unsuspecting world. Donning a hazmat suit is what a person wiser than I would have done after looking at the bottle of sauce and prior to pouring the vile stuff onto my corn meal patties called arepas. 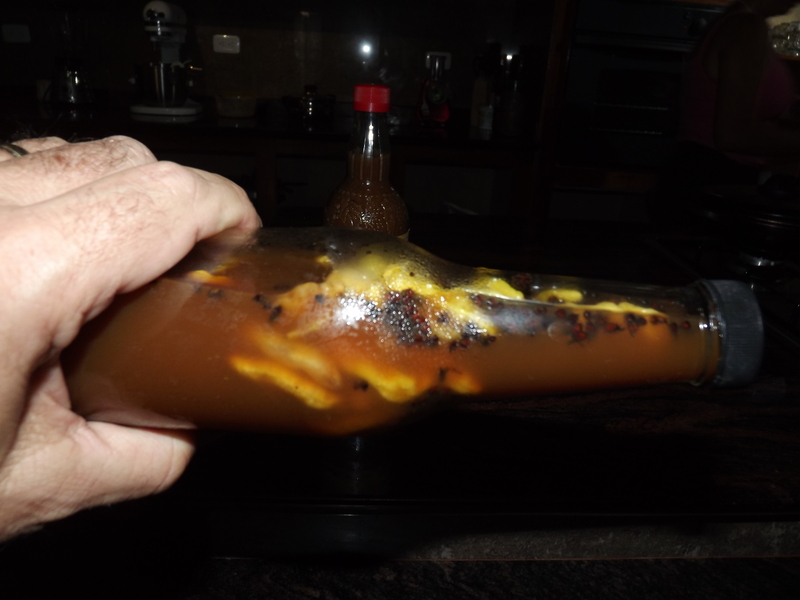 Fat, juicy white grubs, looking like tequila worms on steroids, floated in slow motion in the brown sludge inside the bottle. In addition to the grubs, brown multi-shaped object, hovered and floated slowly up the neck of the bottle in an inverted slow motion Tetris. Upon closer inspection the brown, multi-shaped objects the size of ants turned out to be the heads, abdomens and thoraxes of ants, big ones — army ants, a whole platoon of them — dismembered army ants in an entomological M.A.S.H. gone wrong. Ants, the kind with the over-sized abdomens, filled the bottle, preserved like Lenin and Mao in the noxious liquid. The bottle was their sarcophagus, the brown sludge their embalming fluid. If you remember your unit in high school entomology you will recall that the abdomen on insects is the fat roundish part at the opposite end from the head. The Piaroa tribe, perhaps not aware of the fine distinctions in ant physiology, but accurate nonetheless in their interpretation after observing the big fat part of the ant’s end which scientists call “the rear end” (italics to make it look like it was written in Latin), named them “Bachaco Culon.” A rough translation into English would be “Big _ _ _ army ant.” I used the blanks so as to not offend those readers who may be of a more conservative mindset. Fill in the blank with a three letter word for gluteus maximus, or by naming the animal on which Balaam rode. Anyone conservative enough to be offended by _ _ _ will be biblically literate enough to understand the reference to Balaam. I poured some of the stuff onto my plate and ate it. Why? It looked horrible and tasted worse. I’m not even sure the Piaroa would eat the stuff. They were probably back in their jungle huts thinking, “Ha ha, look what we got the dumb Gringo to eat. Ha ha.” Pride? Stupidity? Misguided sense of adventure? I really don’t know why I ate it; but now, five days into the joys of what is probably acute salmonella, I am seriously questioning the wisdom of having tried the stuff. My flight back to the US was an adventure in human misery. Up at 1:45 AM to get to the airport. It is always hard to get up at 1:45 AM; but after four hours of sleep, interrupted by multiple pain propelled trips to the bathroom, I was truly in a foul and unhappy frame of mind. The Venezuelan airport security personnel seemed to sense my misery and took ghoulish joy in turning my life into a glacially slow purgatory of non-moving lines. Every second in the non-moving lines, the burning magma deep within the geology of my bowels boiled and roiled as the Gondwanaland in my gut seemed to break apart in continental drift. Finally, I was free to get up out of my seat and rush back to the bathrooms at the back of the plane. No! No! No!, the flight attendants were serving meals. The aisle was blocked! Do I climb over? Do I pretend the seats are hurdles? After telling one of the flight attendants of my dire predicament he came to my aid, making my ensuing trips to the back of the plane flow as smoothly as a presidential motorcade. I doubt it was sympathy for me that induced his kind behavior. As a unionized flight attendant he was thinking more in terms of work avoidance. By putting two and two together he realized that helping me to the bathroom was the lesser of two evils. I could feel the love. Several geologic ages later the flight ended and I made it home. If you are fortunate enough to have invested in the parent company of Pepto Bismol you can now retire in wealth, as I have personally helped increase its market share, lifting its stock values to new heights. This is crazy, crazy. Love your vocabulary and skill of expression. I was clearing out OLD e-mails and came to this literary gem!! Vivian, I’m glad you enjoyed it. I have been traveling a lot so have not posted anything recently but I have several more ready to go. Some are serious, and some are humorous. I hope to keep people laughing since this world is getting a bit to serious for me.